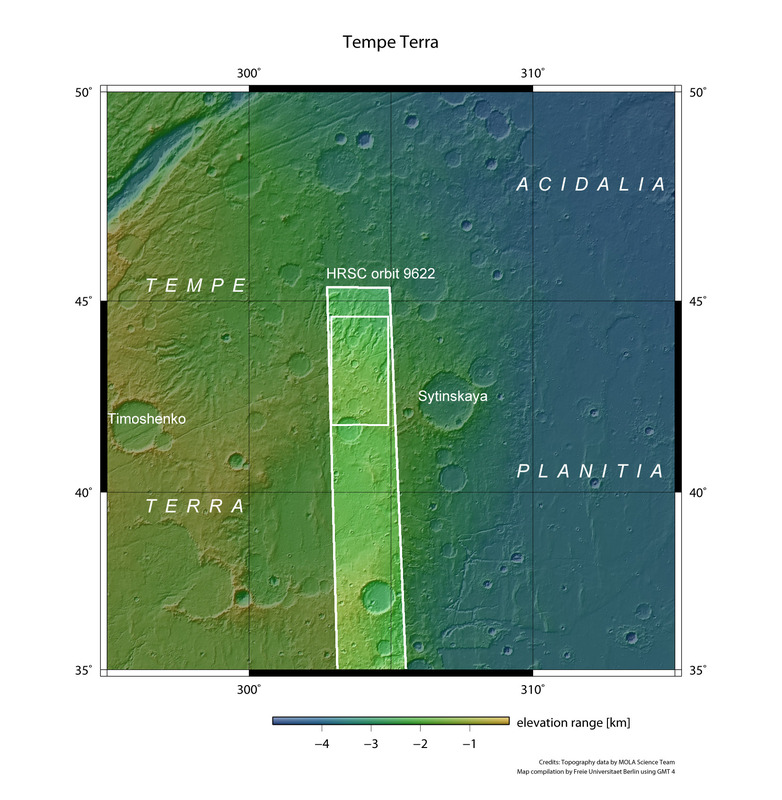 Tempe Terra is located at the northeastern edge of the Tharsis volcanic region and forms the transition zone between the southern highlands and the northern lowlands (also compare press release #265). This area is characterised by a large variety of tectonic structures and is one of the most geologically diverse on Mars. 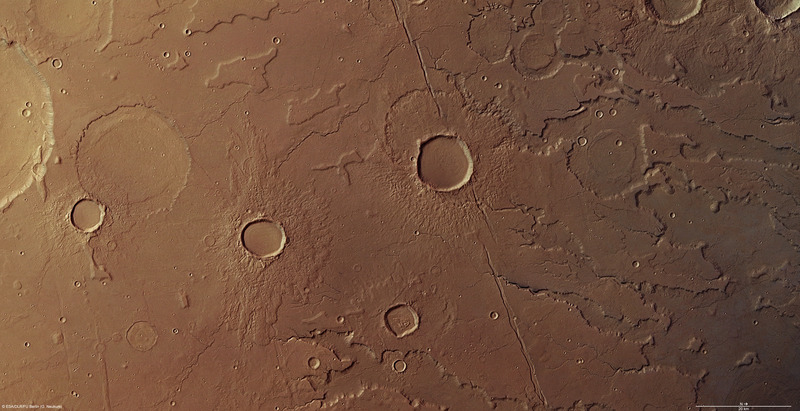 These images from the High Resolution Stereo Camera (HRSC), operated by the German Aerospace Center (Deutsches Zentrum für Luft- und Raumfahrt; DLR) on board ESA's Mars Express spacecraft, which were acquired on 17 July 2011, show a large number of interesting geological phenomena. The effects of different forces can be seen adjacent to one another. 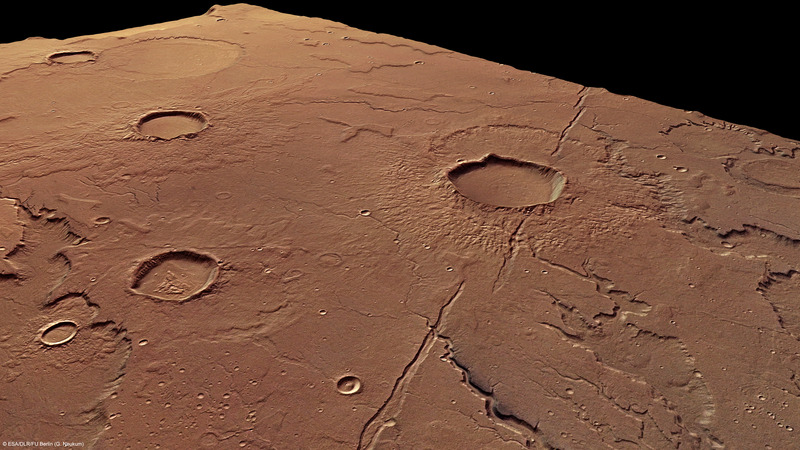 These have led to both extension of the Martian crust and crustal compression, which has created 'wrinkle ridges' (see image detail 1 in the overview image). The most striking result of the crustal extension is a linear graben running across the entire image and only broken by misalignment in a few places. 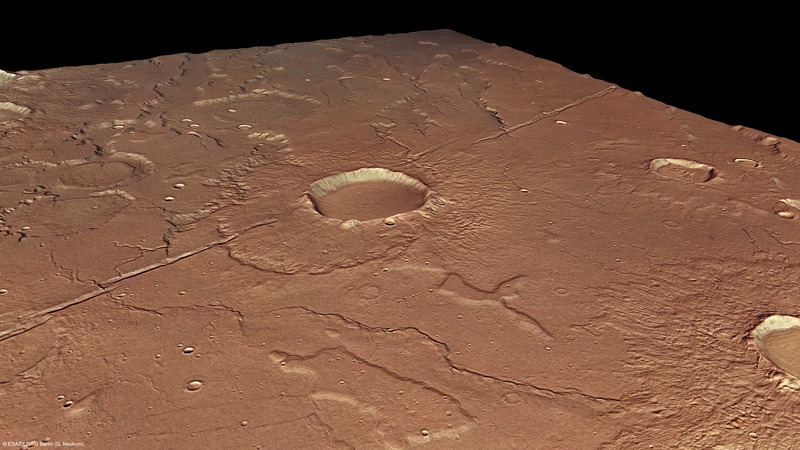 This graben is up to a kilometre wide and is overlaid by a large impact crater some twelve kilometres across and its ejecta; inside the crater, the graben is covered by younger sediments (image detail 2). 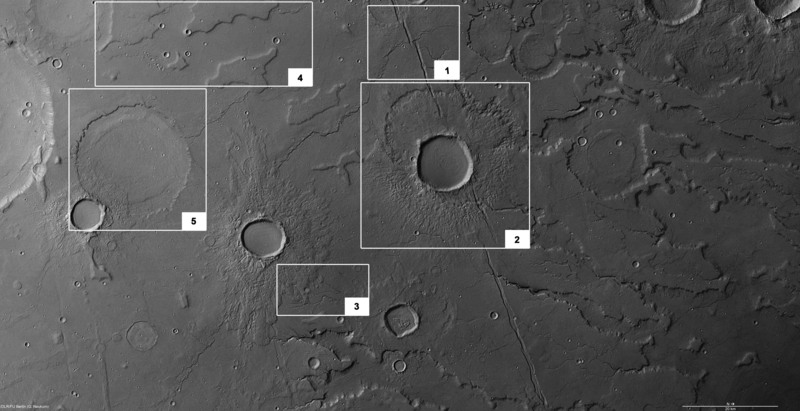 The images show a section of the HRSC image strip located at 42 degrees north and 304 degrees east, obtained during orbit 9622 with a resolution of about 18 metres per pixel. To the north of the graben, in the right third of the image, the terrain falls away to the lowlands by over 1000 metres. The landscape here is marked by several extensive valley systems. 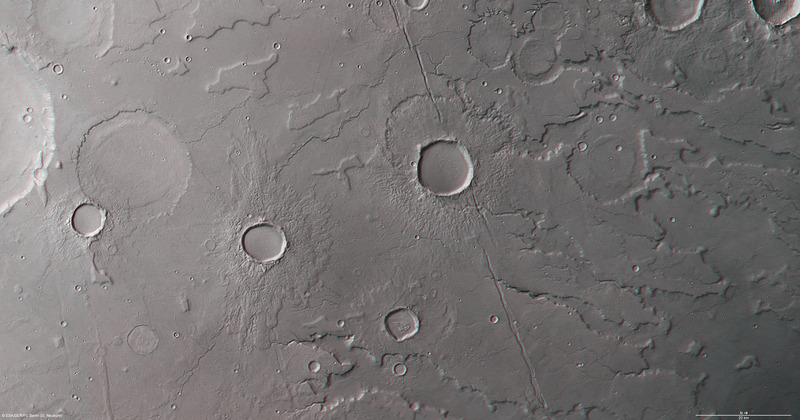 Upslope, a number of smaller, dendritic valleys partially covered by impact craters can be made out (image detail 3). Many younger craters in the region south of the graben that still have well-preserved contours exhibit lobate, concentric structures in their interior that have been caused by a slow moving plastic material. These features, referred to by geologists as concentric crater fill, can be found in a number of places on Mars - including Phlegra Montes, the subject of last month's images (see press release #531). Prominent mesas are visible in the upper left section of the image, to the southwest (image detail 4). 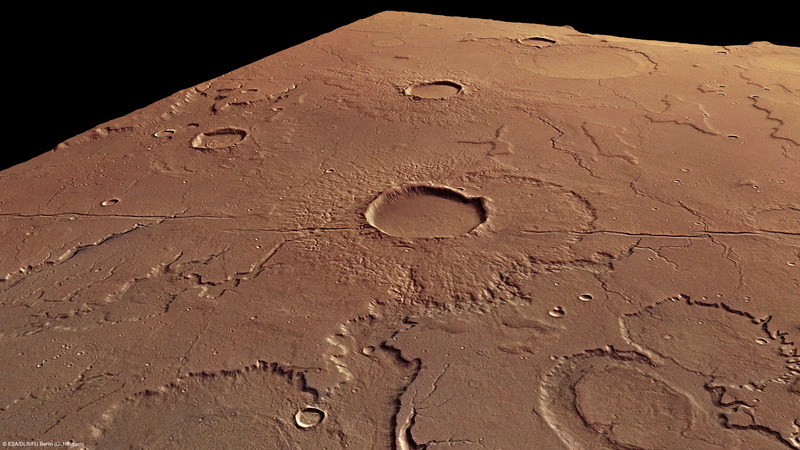 They reveal the original terrain level of the Martian southern highlands. Also conspicuous are the clearly structured ejecta of several impact craters. These partially cover the older flow and graben systems and therefore occurred later. Older, large impact craters (image detail 5) have been almost completely covered with sediment or filled with ejecta. Tempe Terra was first described by Greek astronomer Eugenios Antoniadis (1870-1944, later known as Eug�ne Michel Antoniadi through his work in France). His observations of the Tempe Terra region with a powerful new telescope at the Paris Observatory in Meudon during the opposition of Mars in 1909 - described in detail in 1930 -disproved the theory circulating among astronomers that the 'canali' observed by Giovanni Schiaparelli in 1877 were artificial canals; Schiaparelli himself had serious doubts about this interpretation. 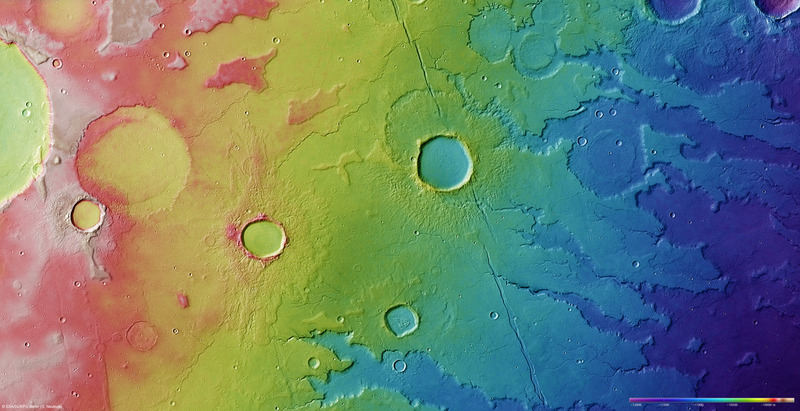 As a tribute to both astronomers, who made important contributions to planetary cartography, craters on the Moon, Mars and Mercury bear their names. Tempe Terra was named after a valley to the north of Mount Olympus in Thessaly (Greece), where, according to mythology, Orpheus' wife Eurydice died after being bitten by a snake while fleeing from her tormenter, Aristaios. The colour images were created using data from the nadir channel, the field of view of which is which is directed vertically down onto the Martian surface, and the colour channels. The perspective views were computed using data from the HRSC stereo channels. The anaglyph image, which conveys a three-dimensional impression of the landscape when viewed with red/blue or red/green glasses, was derived from the nadir channel and one stereo channel. The black-and-white image is based on data from the nadir channel, which has the highest resolution of all the channels. The false-colour view is based on a digital terrain model of the region, from which the topography of the landscape can be derived. The images were produced by the Department of Planetary Sciences and Remote Sensing in the Institute for Geological Sciences of the Freie Universität Berlin.